Paris was born on 6 February 1986 on a bright and sunny day in Auckland, New Zealand. His mother belonged to the sister of a friend of mine, and as February 6 is a bank holiday in New Zealand, I actually got to see the litter being born. I was only going to have one kitten, but on the day I went to pick the a kitten up, two little gorgeous bundles were snoozing, head to head on the back of the couch in the sun, so I ended up going home with two kittens. These kittens became known as Paris and Tokyo. When they were about four years old we moved to Cambridgeshire in England. The six months in quarantine was pretty horrible, but you could visit after the first six weeks. I will always remember how jealous I felt seeing Paris kissing one of the girls that worked at the Quarantine Kennels! Paris’s life was pretty uneventful up until he was about nine years old. He’d had the usual scrapes and scuffles and the odd trip to the vets, but nothing out of the ordinary at that stage. One day, when he was about nine, it was obvious that Paris was in great distress. He was crying, that horrible deep echoing cry, and squatting all over the place as if he was having trouble peeing. Of course, this was a Saturday and at that stage I couldn’t drive, so I had to make an emergency dash to the vets in a taxi! Turned out that Paris had FLUTD – feline lower urinary tract disease. Apparently very common and I was told caused by the muck they put in commercial cat food. Paris was put on a catheter and eventually allowed home on a strict prescription diet designed to stop these struvite stones forming. Of course, Tokyo liked the food and took to it straight away. Paris hated it. For weeks he hated me and looked at me with his huge green eyes pleading me to give him something else to eat. Eventually, he started eating the food and peace reigned for another four years. In June 1999 Paris started to look at bit skinny and worn. To my eternal shame I did nothing about it, justifying my lack of action by thinking that it was “just his age” or the summer heat – all the time fearing he had kidney failure. He started drinking from weird places, like under the plants in the garden while I was watering them, but as he was eating I assumed he was OK. Little did I know that weight loss, excessive drinking and excessive eating are all classic signs of diabetes. 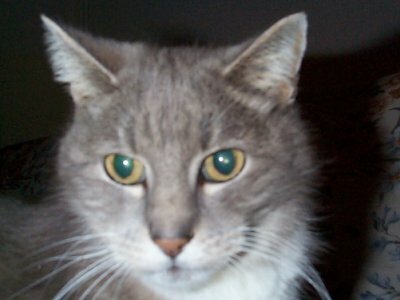 Finally, I took him to the vets in August 1999 when the diagnosis of Diabetes Mellitus was confirmed. The first thing I was told was that I could have him put down! I was completely speechless – killing an otherwise healthy cat for a treatable condition? I was to discover that this attitude was all too common, and is partly the reason for this website. Paris eventually came home on 4 units of PZI insulin a day. Only it wasn’t Paris. It was this limp, lifeless, unhappy shadow of a cat. I had been told to feed him twice a day for half an hour at a time – and this was a cat that had previously had access to food virtually 24 hours a day. So it was off the FLUTD prescription food and onto the Diabetes prescription food – at least he was used to prescription foods and ate it. But he just lay on the couch all day, with no energy to do anything – I really thought that deciding to treat him had been the wrong thing to do. The turning point came one Saturday. I had rung my vet and said how lifeless and tired he was – and I was told to increase his insulin dose that day to 5 units. It nearly killed him. By mid afternoon that day Paris was on his way back to the vets to be treated for Hypoglycaemia – dangerously low blood sugar levels. He was stone cold, totally quiet, obviously not entirely aware of where he was. He let my Mum pick him up (no-one except me can pick him up normally) and he just hung in her arms, with his head swinging from side to side. All the way to the vets in the car he didn’t say a word, and this is a normally very vocal cat. His blood sugar reading at the vets was 1.8 – coma and death were literally minutes away. He was immediately put on a glucose drip and left in overnight. And in a strange way I was relieved because I knew he’d not been right. I finally took matters into my own hands. I learned how to do blood testing at home, I bought a blood glucose monitor. I bought some Keto-Diastix, and I read and read everything I could find out about diabetes. When Paris came home, we made his food available all day (like it had been prior to diagnosis) we went back to the Hills CD prescription biscuits he was used to, and he got blood tested – a lot! By Christmas 1999 Paris was back to his old self – noisy, nosey, affectionate and completely gorgeous. His lost weight was coming back and he was his normal loving self. Paris, it seems, is a “transient” diabetic – he’s not diabetic every day. From the five units of insulin that finally caused his big hypo crash, Paris ended up on one unit of insulin, every other day. And so we went on until mid December 2001 when again Paris was losing weight and condition, even though his diabetes was well regulated. This time it was kidney failure. He was put on Fortekor tablets immediately, which are supposed to improve life expectancy for kidney failure cats – but it doesn’t seem to work for diabetics. Almost exactly six months later, Paris left me to start his tenth life. On 14 June 2002, Paris was put to sleep. He was at home, on my knee, where he’d always been happiest. He was 16 years, four months old, and had been diabetic for three years. My consolation is that the diabetes didn’t kill him. I miss you still, Little Man.